Hand tamping, or jitterbugging (figure 7-46), is done after the concrete has been screeded. Hand tamping is used to compact the concrete into a dense mass and to force the larger particles of coarse aggregate slightly below the surface. This enables you to put the desired finish on the surface. The tamping tool should be used only with a low-slump concrete, and bring only just enough mortar to the surface for proper finish. 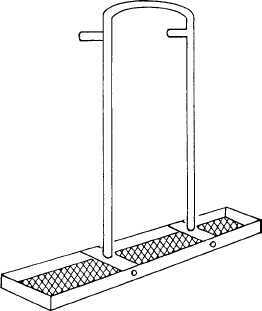 After using the jitterbug, you can go directly to using the bull float. 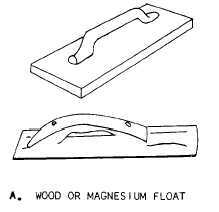 If a smoother surface is required than the one obtained by screeding, the surface should be worked sparingly with a wood or aluminum magnesium float (figure 7-47, view A) or with a finishing machine. In view B, the wood float is shown in use. 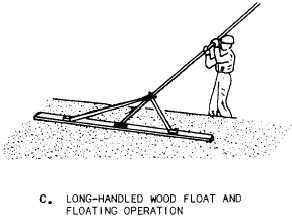 A long-handled wood float is used for slab construction (view C). The aluminum float, which is used the same way as the wood float, gives the finished concrete a much smoother surface. To avoid cracking and dusting of the finished concrete, begin aluminum floating when the water sheen disappears from the freshly placed concrete surface. Do not use cement or water as an aid in finishing the surface. Floating has three purposes: (1) to embed aggregate particles just beneath the surface; (2) to remove slight imperfections (high and low spots); and, (3) to compact the concrete at the surface in preparation for other finishing operations. 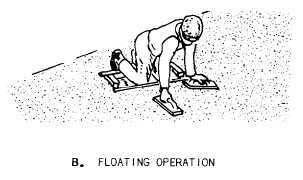 Figure 7-47.-Wood floats and floating operations.